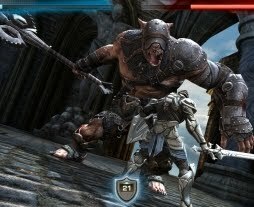 Singaporean iPad, iPhone and Android Blog: Infinity Blade from Epic Games to debut at App Store on 9th Dec! Infinity Blade from Epic Games to debut at App Store on 9th Dec! Remember Epic Citadel? That awesome game app that wasn’t really a game? If you recall sometime ago, Epic Citadel enjoyed a brief moment on various Top App lists several months ago when lots of curious folks downloaded this free demo of the Unreal 3 Engine for the Iphone/Ipad. It didn’t do anything much in terms of fun except let you wander around a medieval castle but the graphics were stunning and controls were intuitive. So here comes Infinity Blade which will debut on Thursday 9th Dec at $5.99, promising game-changing visuals and *spoiler alert* a new way of sustaining re-playability by regenerating the player as ‘the son’ (like a multi-generational fruit-fly experiment with experience points) with all of your equipment intact if you, *and you will*, die before completing your quest. Official Trailer’s over here on Youtube. The price tag is in a way justified if it’s as cool as promised and apparently it’s a universal app, or what I call: ‘D1P2’- download once, play it twice, on both your Ipad and Iphone.